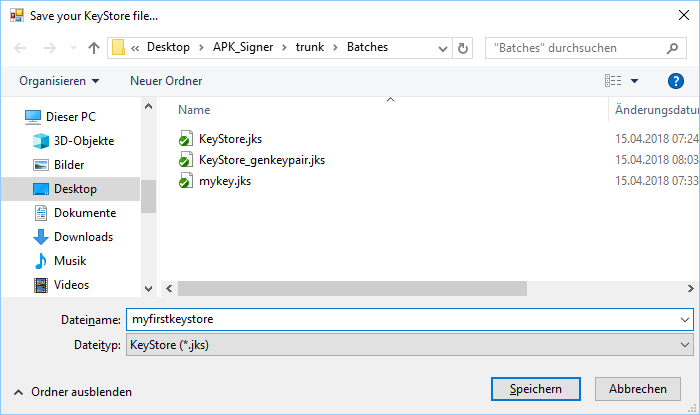 The APK Signer Tool v2 allows you to sign and align your Android application using the “apksigner” included in the Android Build Tools, managing your keystore files and certificates and so on. The tool uses the .Net runtime by Microsoft. Make sure that you have the runtime installed on your computer. Please, download our free APK Signer Tool (v2) below. Please note, the current version is a beta version. If you are facing any problems, please let us know! 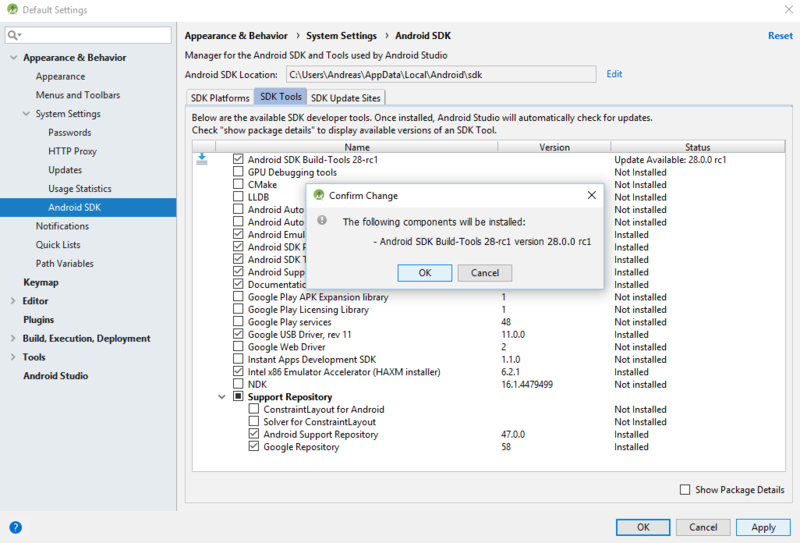 To get all functions working, you need to download the Androdi Studio or at least the Android SDK. Please find the download link below. Also to get some features working, you need to install the Java Developement Kit (JDK) on your local machine. Please find the download link below. Thank you for downloading our APK Signer Tool v2! Please read the following documentaton carefully. If you got any errors, please check the Error Handling section below. If your error is not covered there, please submit a support request either via our Ticket center or our forum. To be able to use all functions of the APK Signer Tool you need to specify the path to your your Java JDK installation and to your Android Build Tools installation. To do so, just click the corresponding button to browse the installation folder. If the path is valid, the input form will be set to green. Please make sure that you have installed the Android Build Tools (via Android Studio) and the Java Developement Kit (JDK) on your local machine first. The tool allows you to create your own Keystore file (.jks / .keystore) if you have none. To do so, please select the Keyfile Generator (JDK) tab first. Select the export path for your KeyStore file with the Browse button. Give it a proper name and click Save. You either can save the key as .jks or .keystore file. Both are working. Then, please enter all needed information into the input forms. If your input is valid, the input form becomes green. The password must be at least 6 chars long! When you feel ready, click the “Generate Key File” button below. When the key has been created successfully, you will get a notification. If you want to sign or / and align an application, select the Align & Sign tab first. Here you either can sign or align your application, or do both in one step. 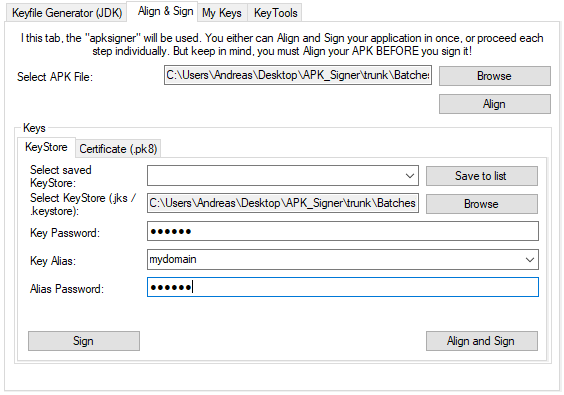 Due to the fact that our tool is using the “apksigner.exe”, you have to align your APK before you sign it! To align and sign your application, please select your APK file first. To do so, use the Browse button. Please make sure to select an unsigned and un-aligned APK file! In the next step, select your keystore file. To do so, please click the Browse button. This tool allows you to save your keys on your local machine. So you only need to select your key at the dropdown to use it. Learn more at the “My Keys” section of this guide. The tool automatically checks the key password. If it’s valid, the alias gets fetched automatically. Otherwise you will get a notification. If all information are provided, click the Align and Sign button. Then, your APK will be aligned and signed automatically. When all went good, you will get a notification. You also can check the consol on the right hand side. The tool allows you to save your keys in a collection. To do so, just click the “Save to List” button at the Align and Sign tab. You must enter all information for your key before you can save it to your list! To use a saved key, just select it at the dropdown menu at the Align and Sign tab. All needed information will be fetched from the saved key, like the alias, the password and the path. The key path must be valid! Do not move or delete your key on the saved location! This will not delete your keystore file on your local drive. Only the entry in the tool will be removed. The event monitor shows the application log. If you have any troubles, please check the event monitor first. You can clear the log by clicking the Clear Logs button. The tool has some defined error codes. Those codes make it easier to find the problem. Please, see the following error codes and their description. If you get the error code 0x0001 you have selected an invalid path for the Android Build Tools. Please make sure to select the “build-tools” directory. The application will fetch automatically the highest available version of it. You need to install “Android Studio” to get the build tools. Please keep in mind that you need to install Android Studio to get the build tools installed on your computer. Afterwards you can find the build tools here. If you get this error, please go to Android Studio and update your build tools SDK to the latest version. If you get this error code, you have selected the wrong JDK installation (maybe the JRE or a subfolder). Please make sure that you select the root folder. If you get this error, please check your pathes for your JDK and Android Build Tools installation. This error says, that either the “apksigner.exe” (Android Build Tools) or the “keytool.exe” (JDK) cannot be found. If you get this error code, the tool has problems to clear the log file. This can be caused if you have the log file open with another application. Try to close it and try again to clear the log. With the latest update the tool has become localised. For now, it’s available in following languages. If you want to provide any further translation, please let me know in the forum! Please find a list of the known issues below. Those issues will be fixed with the next update. Thanks to Martin for reporting this issue. It seems that the tool has issues when a space is in the path / folder name. Till this is fixed, please replace the space with another char. Should be fixed in version 2.0.2-beta. Please, if you are facing any issues, open either a ticket or a forum post. If you just leave a bad feedback to this article, I have no chance to contact you for further details! Fix: Changed “apksinger.exe” to “apksinger.bat” in error dialog. Fix: Fixed auto detection of the alias name while using a “.jks” keystore file instead of a “.keystore” file. Improvement: Now if you align and sign the APK separately the APK path will be updated automatically to the aligned APK. 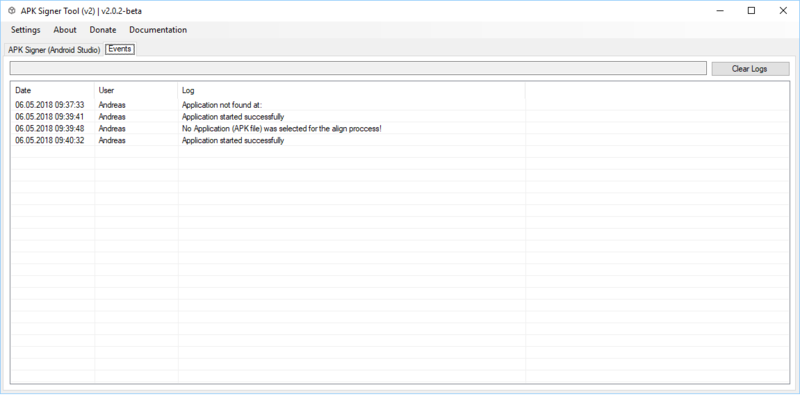 Fix: Fixed issue that the log file couldn’t be written (was blocked by an unclosed reader of the tool). New: Localisation added. For now the tool is available in English and German. If you want to help translating the tool, please let me know in the forum! Thank you. Hotfix: Avast thought file includes male ware. Added some publisher information to the tool. Now it looks good. please submit a new topic at our forum. Please slso provide the basic information you entered to create the key like key type, encryption and so on.